The pre amp / driver boards from the 6SELA „Tischverstärker“ models (6SELA 2524, 2525 and 2600) using 2 EF40 and 3 ECC83 tubes offer a nice base for pre amp projects. 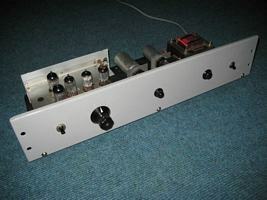 The original design uses the 2 EF40 tubes for the microphone input stage, 2 ECC83s for the preamp / tone control stage and 1 ECC83 as driver / phase splitter. 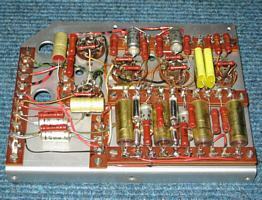 Now my goal was to build a stereo preamp with RIAA section for my KL-V402 amps. I have built up 3 different types. 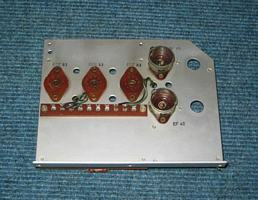 Here the Rimlock sockets from the EF40 tubes are used for 2 EZ40 rectifier tubes. For my MC cartridges I use a separate step up unit with transformers. 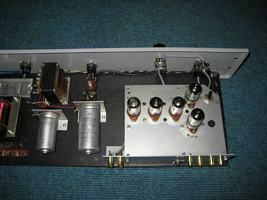 The line stage has a slight amplification (+9dB) and works great with pre amps with higher sensitivity. If higher amplification is needed, the 500 Ohms resistors from the output stage can be changed for 1k (15dB amplification). Omitting this resistor amplification will be pretty high (+27dB), but can be useful for vintage booster amps without input stage (as the Siemens 2733 EL34 amp). Same as above but using the Rimlock sockets for EF40 tubes in original configuration. 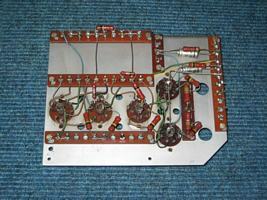 This is pretty easy as the wiring of the board does not need any changes in the EF40 section. I have added a switch for the EF40’s B+, because it should be switched of when using the MM input. 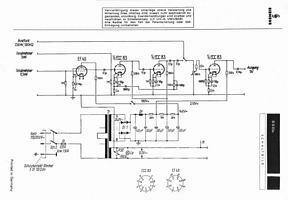 This way there is no switch in the phono signal path. 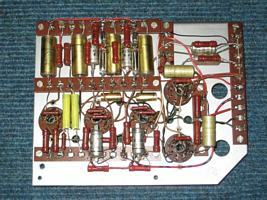 Same as before, but without amplification in the line stage. 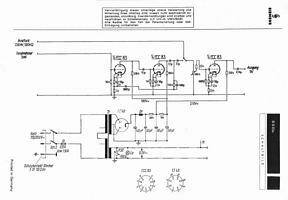 The cathode follower design guarantees very low output impedance, so that cables and following (power) amp stages are uncritical. 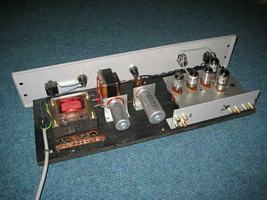 This preamp works perfect with any power amp of higher sensibility (most power amplifiers have…).